I’d like to begin the ninety-first entry in the little online column that could by welcoming new readers. It only took six months and ninety entries, but the Weird Accordion to Al finally seems to be finding a modest but appreciative audience. For most of the column’s life it has been almost perversely unpopular. I write “perversely unpopular” because “Weird Al” Yankovic is, if I might wax a little hyperbolic, easily one of the most beloved and popular humans ever. He’s right up there with Moses of Biblical fame and Pat Boone in the 1950s. Yet in trademark self-defeating form, I chose to write about an exceedingly popular figure with an obsessiveness and completeness damn near guaranteed to push a mainstream audience away. Al may be a beloved American icon but how big can the audience for an eleven hundred word manifesto on “Gotta Boogie” really be? Nathan Rabin’s Happy Place is a cult website, and the Weird Accordion to Al is a cult within a cult. Thankfully, that cult is growing steadily thanks to three factors. First, Al was kind enough to commemorate me making it past the halfway point by tweeting out a link to the column to his nearly five million followers. That sure helped. Then something even more exciting happened: Al announced that he is going to break with tradition and eschew the costumes, video screens, hit-laden set lists and extravagant spectacle that have long been staples of his live performances. The excitement over the novel nature of Al’s big nation-wide jaunt made my perversely exhaustive project unexpectedly useful and timely: these aren’t just oddball non-single oddities I’m writing about obsessively here, but songs “Weird Al” Yankovic could very well break out in concert for the first time in literally decades, if ever. How exciting is that? With the big announcement of next year’s tour Al’s musical history, a history I’ve explored more extensively than any other writer in history, suddenly roared to life and became the blueprint for his future. These songs are suddenly all in play. In a related development, Al was recently interviewed by Rolling Stone’s Andy Greene (who won a permanent place in my heart for giving You Don’t Know Me But You Don’t Like Me four stars) about his upcoming tour and was asked about this very column. Oh my goodness! What a thrill! Al said he was reading the column, and described me as an old friend, and I was overjoyed. I’d noticed a surge in traffic and when I looked for the source, sure enough, it was a link in the Rolling Stone article. For a mom and pop operation like Nathan Rabin’s Happy Place, it was huge break. I really hope that if you were introduced to the column only recently, you stick around and explore the archives, as I’ve already devoted 100,000 words or so to the man’s work, and we’re only half done. New readers, I should probably warn you that I found it impossible to write 600 to 1000 word entries just on Al’s songs so I felt the need to weave in a lot of narrative aspects, kind of a new journalism kind of thing. And, to be honest, I took a lot of liberties with the facts of Al’s life to make things interesting for myself and, to a much lesser extent, the reader. For example Al dies of a fluke illness just after recording Polka Party! in the Weird Accordion to Al, if not necessarily in his “real life”, but is then brought back to life by Dr. Demento, who in this timeline at least is a genuine mad scientist, an amateur necromancer, and, I think this really spiced things up, Al’s illegitimate, long-lost half-brother. As I’ve chronicled earlier, Al reluctantly took on the mantle of Gotham crime-fighter The Batman briefly in the late 1980s and again early in the 1990s and, in an appeal to YA audiences once the Weird Accordion to Al book comes out, in the Weird Accordion to Al, the titular popular American pop parodist is alternately a sensitive vampire and an Emo werewolf immersed in a tragic romance with a sulky girl named Bella. To bring you up to date, by the time we catch with Al deep into Alapalooza he’s a popular, Grammy-winning veteran pop artist and American icon but within the world of the Weird Accordion to Al he’s also a scruffy, down on his luck private detective with a sassy talking parrot named Bonkers. Will Al and Bonkers find out who’s been murdering student nurses and using their heads as bowling balls? None of that is true, of course. No, writing 600 to 1000 word articles even about tracks like the 21 second curio “Harvey the Wonder Hamster” has come surprisingly easy to me, and I’ve never, but never, been reduced to being silly or self-indulgent. This brings us to the second to last track on Alapalooza, “Waffle King.” It’s a tribute to a very specific era in Peter Gabriel’s career long after he stopped being a poster boy for Prog Rock theatricality and established himself as a solo artist to be reckoned with. “Waffle King” is a loving tribute to Gabriel’s mid-1980s music video smashes “Big Time” and “Sledge Hammer”, when he devoted himself to making big, cartoony pop songs for kids with ubiquitous music videos utilizing the same stop-motion animation technique as Al’s Grammy-nominated video for “Jurassic Park” from this album. My reservations with “Waffle King”, a song I respect more than love, begin with it sounding not unlike “Talk Soup”, which to me at least also has the vibe of Gabriel’s mid-1980s smashes. “Big Time” and “Sledge Hammer” are both tongue-in-cheek exercises in pop art braggadocio so goofy they border on novelty songs. The breakfast titan crooning “Waffle King” is similarly full of himself, and, presumably, also the delicious waffles he’s peddling in song. 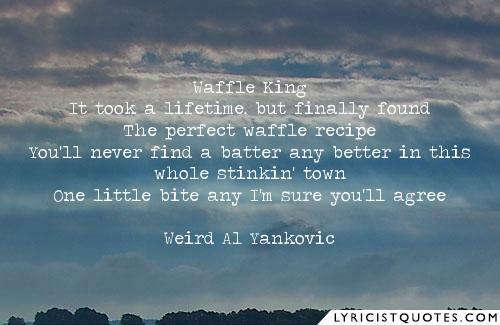 To paraphrase a later Al original, this food pimp has a lame claim to fame and while “Waffle King” nails the sound, style and production of Gabriel’s biggest hits the song is distressingly light on jokes, if very big on feverish exaggeration, sneering attitude and screaming hyperbole. The singer doesn’t just think making superior waffles makes him special: he seems to think it makes him superior to everyone else on earth. He doesn’t just want people to eat his tasty treats: he wants to be worshiped as an angry, waffle-making God. The Soup Nazi is a mellow hippie compared to this waffle-pimping sociopath. “Waffle King” made me realize that the 1990s might be my least favorite era for Al. I think his last three albums measure up to anything he’s done and of course the 1980s were Al’s golden age but the 1990s are too full of commercial calculation and songs rooted in smash movies and television shows for my taste. It’s still great, of course, and full of highs like “Frank’s 2000 Inch TV” and “Everything You Know Is Wrong” but there’s a slickness to it that makes it a little harder to connect with than the rest of Al’s oeuvre.